When you’re cold, sometimes nothing but a piping hot drink will warm you up. But you don’t have to stick with the old standbys—tea and coffee. Enjoy a spiked treat to warm not only you, but your soul! Anthony Chisholm, Beverage Director of The OFFICE Tavern Grill in Morristown NJ, turns your average after-dinner beverage into an extraordinary ending to your meal. Yes, you can actually drink your apple pie! This cider is seasoned with cinnamon, ginger, cloves, nutmeg and allspice. For an adult drink, you can add brandy. The cider is simple to make, and you can garnish it with cinnamon sticks, which you can use to stir your delicious concoction. This recipe is simple, sweet and creamy. You combine finely chopped white chocolate, like Ghiarardelli, with milk, Frangelico and freshly grated nutmeg for garnish. It’s perfect for the holidays, a cocktail party or a casual dinner with friends. Got a cold? This Scottish drink might give you some relief. It’s a soothing mix of Scotch whiskey, hot water, lemon juice and honey. There’s still time to serve fall drinks, and this one is not only tasty—it’s pretty. 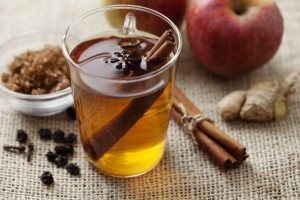 The Autumn Wassail features a blend of apple cider, pomegranate juice, orange juice, lemon juice, cloves, allspice, cognac and some rum. You can garnish it with apple slices or cranberries.